TRI-ACTIVE HAIR NAILS B-ZINC+ COMPLEX is a food supplement with fish and borage oils, vitamins and minerals. 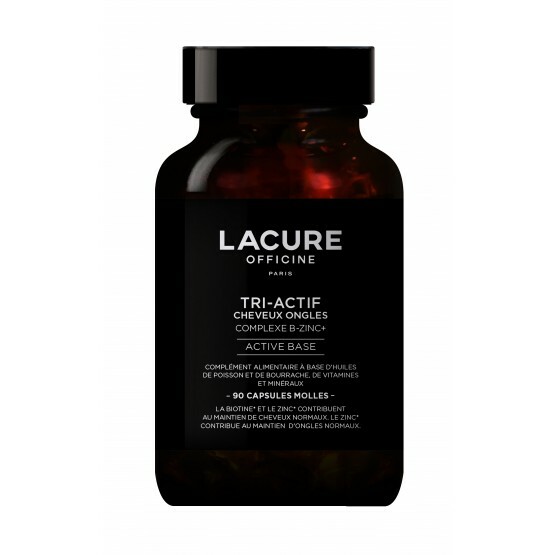 LACURE Officine proposes a food supplement designed for the beauty of your nails and hair, TRI-ACTIVE HAIR NAILS B-ZINC+ COMPLEX based on several group B vitamins (Biotin) and zinc. Biotin, known for hair beauty, helps look after normal hair. Zinc is an essential trace element which plays an important role in many metabolic processes. A deficiency in zinc can lead to numerous problems (hair loss, brittle nails, etc.). 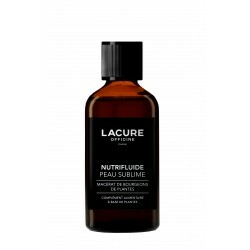 Zinc contained in this formula helps look after your nails and hair, to the envy of all others! 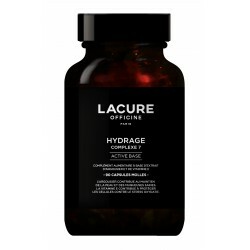 Fish oil titrated in EPA (eicosapentaenoic acid) and DHA (docosahexaenoic acid) - Capsule coating: gelatine, glycerine, colourants: irone oxide and titanium dioxide - L-ascorbic acid (Vitamin C) - Borage seed oil (Borago officinalis L.) titrated in GLA (gamma-linolenic acid) - L-Cystine - Iron sulphate - Nicotinamide (Vitamin B3) - Zinc sulphate - D-alpha tocopherol acetate (Vitamin E) - Pantothenic acid (Vitamin B5) - Magnesium oxide - Cyanocobalamin (Vitamin B12) - Pyridoxine Chlorhydrate (Vitamin B6) - Riboflavin (Vitamin B2) - Thiamine mononitrate (Vitamin B1) - Folic acid (Vitamin B9) - Biotin (Vitamin B8) - Soy Lecithin - Yellow beeswax - Anti-caking agent: Colloidal silica.